Calling on new neighbors is one of those rare instances when dropping by unannounced is good manners. If you see your new neighbor in their yard, go over and say “hello” or knock on their door and introduce yourself. You may be able to offer helping them with the last little boxes that they are just dreading to take up one more flight of stairs. You might be invited in, or not if they aren’t ready for “company." Keep the visit short. The goal is simple: To welcome them and exchange names and perhaps telephone numbers. If you become aware of newcomers weeks or even months after they move in, you can still knock on the door and introduce yourself; there is always time to be neighborly. A welcome-to-the-neighborhood gift will brighten the newcomer’s day and ease the hassle of settling in. Typically, gifts are homey and inexpensive: a plate of cookies, a bouquet of garden flowers, a stack of (new) local take-out menus, or list of the upcoming city events. Offers of assistance require sensitivity to a new neighbor’s actual needs. In most cases, you’re a stranger to your new neighbors, and some may not feel comfortable accepting your well intended offer to help. If you make an offer, say when you’ll be available and what you can do. Let new neighbors know you’re happy to answer questions and give directions. Information about schools, places of worship, town services, restaurants, grocery stores, good places to shop, and reliable service providers is always useful. It isn’t helpful to impose on your new neighbor’s time, gossip about other neighbors, or in any way badmouth the neighborhood. Who makes the first contact when someone moves into a neighborhood? It really doesn’t matter who takes the first step. When you see a neighbor fetching the mail or recognize a person from the neighborhood when you’re out, take a few moments to smile and introduce or identify yourself. Regardless of who makes the first move, meeting and greeting is a fundamental of good manners. As a newcomer, you’re likely to be on the receiving end of gifts, advice, and helping hands. It’s certainly okay to decline help politely if you don’t need it right then or postpone visits until you’re a little more settled. But do be sure to show your appreciation to your new neighbors for their thoughtfulness. A housewarming is one of the few parties you can throw for yourself. 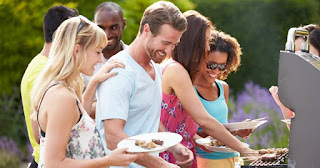 A casual affair such as a backyard barbecue is an excellent opportunity to introduce neighbors to your family and old friends. Be sure to include next-door neighbors and anyone you see regularly. 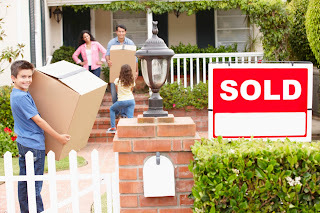 When you move into a new neighborhood, you may wish to establish your willingness or unwillingness to participate in neighborhood activities or organizations. When asked, it’s fine to state what you will or won’t do. On the other hand, it’s smart to show support for your community and to participate when you can. You can maintain your privacy without being seen as standoffish. By attending the occasional block party or association get-together, you’ll meet people and your neighbors will grow to love you...just as much as you will grow to love them and your new neighborhood! Haven't found your dream neighborhood yet? We can help!Give us a call today and we can get you in touch with one of our amazing Realtors!